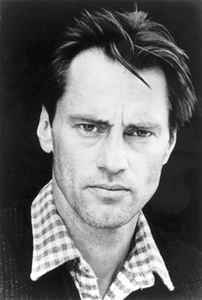 Sam Shepard (born November 5, 1943, Fort Sheridan, Illinois, USA - died July 27, 2017, Midway, Kentucky, USA) was an American playwright, film director, screenwriter, author and actor. He received a Pulitzer Prize in 1979 for his play 'Buried Child'. He collaborated with a number of people, including Wim Wenders, Michelangelo Antonioni, Dolly Parton, Bob Dylan and Ridley Scott. He was elected to the American Academy Of Arts And Letters in 1986, and received the Gold Medal for Drama from the Academy in 1992. Shepard also served as docent with Professor Gary Grant at Bucknell University, Pennsylvania, USA. Married to O-Lan Jones (1969-1984, one son) and in relationship with actress Jessica Lang (1983-2009, two children -daughter, son-).